We offer both conventional dentures and implant supported dentures to our patients in Leighton Buzzard and the surrounding areas. 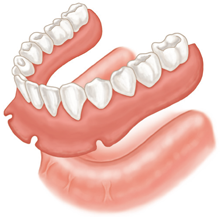 What are implant-supported dentures ? In order to secure your dentures, specially designed titanium posts (typically 2 to 4) are gently placed into the jaw bone to enable them to bond with healthy bone and form a solid and permanent base. 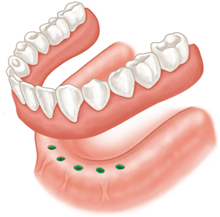 Dentures are then adapted to fit on the implants either in removable or permanent form. 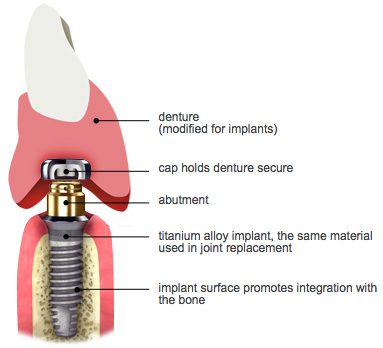 Why choose implant-supported dentures ? What are the options for dentures ? The titanium posts (also called implants) are carefully placed in the jaw. They are then left to fuse with the bone, a process also referred to as “osseointegration”, for a period of between 4 to 6 months. It is sometimes possible, however, to attach new dentures or a titanium bridge (also referred to as “all on four”) immediately after the placement of the implant. This depends on how many implants are placed. The average appointment to place the implants is around 2 hours. There is then a period of healing required so the implants can fully integrate with the bone, before they can provide full chewing ability. The placement of the implants to secure your denture is carried out under a local anaesthetic. The after effects are similar to having a tooth extracted so you may feel mild discomfort due to the normal healing process. However, this is easily managed by taking over-the-counter pain killers for 2 or 3 days after the implant procedure. Can everyone have an implant secured denture ? The suitability of a dental implant to support your dentures is primarily influenced by how much existing bone is available in the jaw. As part of your initial assessment appointment we take an X-ray to determine the best treatment option for you. We also ask you for your medical history to assess any contraindications or risks of reduced treatment effectiveness. In cases where there is insufficient jaw bone to properly secure your implants, we may be able to offer you bone grafting treatment in order to strengthen the bone before placing the implants. We work in partnership with Biohorizons®, one of the leading international suppliers of dental implants.